Below is the information from our 2018 Dealer Challenge. Details on our 2019 Dealer Challenge will be announced in the coming weeks - but this year's trophy will be a WINNER TAKE ALL event in August or September. Can your dealership topple the two-time champion Manchester Honda Team this season?? We're thinking that there may be a bounty posted (stay tuned). This dealer challenge series is run in the spirit of teamwork and fun. It is seamlessly woven into our Monday track day at NHMS on September 16th. The award ceremony will take place right after the conclusion of the racing, with the trophies, purse money and bragging rights all on display. All are welcome!! Teams may consist of up to 5 riders. 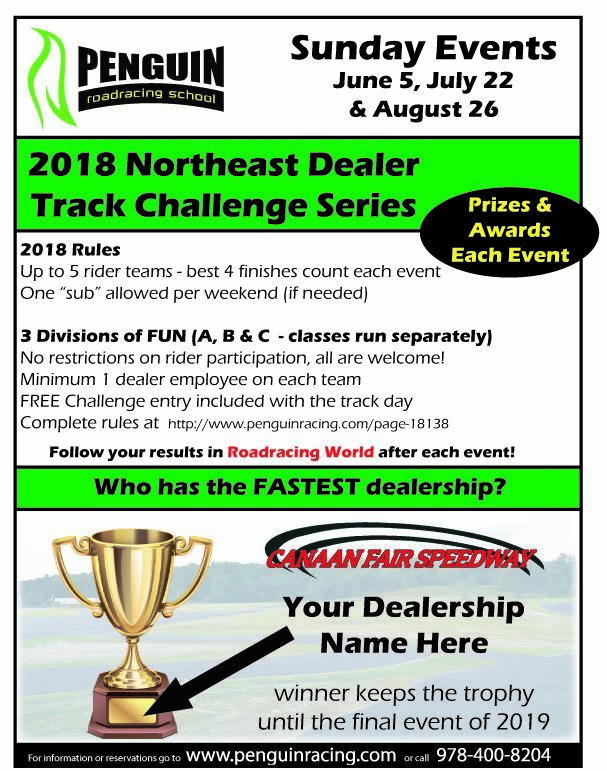 Each team must have one dealership employee (preferred, but not mandated, to ride each weekend) The best 4 finishers of each event will score points towards the Team Challenge Championship cup. Points will be awarded in proportion to the number of riders who start each race, with bonus points for finishing 1st (3 points), 2nd (2 points) or 3rd (1 point). For example, in a class with 12 entries, the first place finisher would get 15 points and the 12th place finisher would get 1 point. Riders must complete 1 lap in order to score points. Penguin may, at it's sole discretion, assign riders to the class that is deemed most appropriate for any individual rider. The max number of riders in a class is 20. Should there be more than 20 entries in any one group, that class will be split. Divisions will be announced by Penguin 60 days before the event and all classes will be scored separately. Former racers will be placed in the class deemed most appropriate. If you have been out of racing for 4 years or less, you will generally be placed in the class that you were most recently licensed for. If your absence from active racing has been 5 years or more, you will generally be dropped down one division. Important: in the "C" Street Bike division, there is a focus on fun and aggressive passes are not allowed.